She is widely known by many for her nickname SusieQ! Her full-name is Susie Wong. She was born in Canada and grew up in Toronto. Her extraordinary energy as a Celebrity Fitness Trainer & Fitness Clothing Designer propels her to strive for excellence and knowledge. Since childhood she had an incredible interest in Television and believes that she was born to be on TV to speak to many people! At an early age, she memorized TV commercials, “I Love Lucy” TV shows & music videos. Often, her Mom would tell her “you better know your school work, like you know the TV set”. SusieQ has a love for music, dance and exercise! In elementary school, she volunteered to perform exercises to warm-up her peers in Physical Education classes. Growing up, SusieQ lived on snack foods, fast foods & Kool-Aid. Being competitive by nature, she became actively involved in her elementary school’s track and field program, which included participation in the shot put, long jump and high jump. In high school, SusieQ discovered weight training and began exploring neighborhood gyms where she would use guest passes to observe and participate in group fitness classes. SusieQ was completely clueless about proper nutrition. Later, she specified on attaining an athletic build and it was only then, where she began learning about nutrition, researching & experimenting, the various effects it had on her body. She was always active & competitive however; her body never displayed a lean look, because the body never lies! Working at the local YMCA, SusieQ became certified as a Fitness Instructor & Personal Trainer. Later, SusieQ was accredited by the Aerobics and Fitness Association of America (AFAA) and the rest as they say is history. Despite her personal fight against weight fluctuation and learning to maintain a healthy lifestyle, she is determined to stay grounded and search for creative and entertaining ways to help others to achieve their goals while learning herself. SusieQ calls herself the “professional fluctuator” of weight. She has carried extra body weight and has the pictures to prove it (which will be posted soon, as seen on the “Arms of a First Lady” DVD-Bonus Feature section). In 2007 SusieQ officially founded “SusieQ FitLife LLC” as a means to provide a positive outlet and portal to motivate people to “Get a FitLife” through lifestyle products and services. SusieQ FitLife is truly about living “Your FitLife”. This allows SusieQ to spend much of her time to work on good nutritional habits and different variations of working out the body to attain different results (SusieQ FitLife: Arms of a First Lady DVD – Incorporates this system with “Watch Your Mouth” Essential Nutritional Segment & “The First Lady Workout” Challenging your body every step of the way). SusieQ is about helping others to develop a positive energy and attitude. She makes helping others a top priority in her life. SusieQ volunteers as a Group Fitness Instructor teaching innovative exercises for participants prior to the fund-raising events. 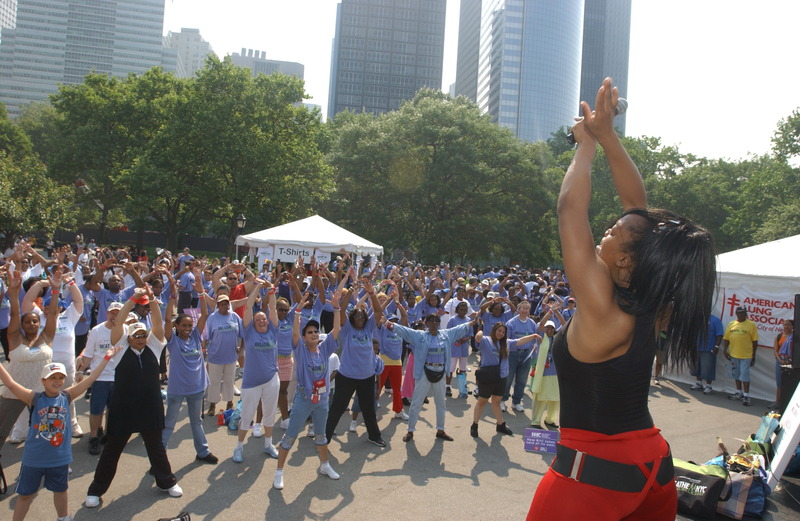 Every year SusieQ is the leading Fitness Trainer with the American Lung Association – Asthma Walk in Battery Park, The American Diabetes Association – Bike-a-thon, The New York City Housing Authority Annual Kids Walk & the ALL-NEW Fight For Air Stair Climb! SusieQ creates & designs her own Women’s Fitness Clothing Line appropriately titled “SusieQ FitLife” by Susie Wong, which will soon be officially launched. The clothing line will also consist of active-wear items that can be worn from the gym to the streets. Sizes will range from women’s petite to women’s plus sizes . . . there will be something for everyone. Keep your eyes open for the SusieQ “SuperHero” themed active wear designs coming soon! SusieQ was recently featured as a Fitness Expert & Trainer on “The Dr. OZ Show”, ABC’s “The View”, NBC’s “The Today Show” & “The Early Show” on CBS. She is the creator, choreographer & producer of “SusieQ FitLife: Arms of a First Lady” Fitness DVD (a full-body workout focused on targeting the arms). SusieQ is a Media Personality & TV Host who appeared on Black Entertainment Television (BET), The Food Network, HGTV, LXNY, Star TV, Much Music, Breakfast Television, CP24, NY1 TV “Teen Vision”. SusieQ has covered red carpet interviews for a Miami Beach podcast event. She specializes in Voice-Over work for television commercials, live-on-air remotes, reporting, and radio for companies including: NY1 TV Network, WBLS, Hot 97FM, Hot 103.5 FM & AM530, Power 105.1 FM & 103.5 WKTU. SusieQ Hosts & Produces the SusieQ FitLife, show broadcast online. The SusieQ FitLife Show is an “Entertain-Fit” (an entertainment/fitness lifestyle) program that is designed to Excite, Inspire, Entice, Drive and Entertain viewers to START doing something different with their lives for the better. This is a fresh and entertaining start to creating a healthy lifestyle with fun and ease reminding us not to sweat the small stuff in life. The show makes quite an impact on our thoughts while giving ourselves a chance to improve our lifestyle! Watch SusieQ in Action on TV!